When designing the system the same design method should be followed as when dimensioning traditional consumers' networks. 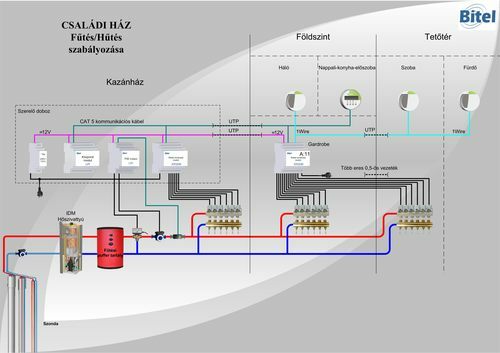 ZIMENT® wall-heating/cooling system can be calculated using any designer program. Basic data are included in WinWatt designer program, it makes designing simple and fast. When beginning the planning, the temperature techniques and vapour diffusion characteristics of outside wall structures should be checked in accordance with Standard No. MSZ-04-140-2/1991, by checking the layers of the building structures (such as walls, floors and roofs, etc.) to be built in with the architect. The course of calculating heat demand does not differ from traditional planning processes. It is recommended to calculate heat load according to Standard No. MSZ-04-140-4. To calculate the heat load of the rooms and the total heat load of the building (with regard to the simultaneous heat load of the rooms), it is reasonable to use a dimensioning software. The course of calculating heat load does not differ from traditional planning processes. The calorific output of heated wall surfaces is ~84 W/m2 in the case of 40 °C flow water temperature and 20 °C planned indoor temperature. The output of cooled surfaces is ~45 W/m2 in the case of a 20-21 °C surface and 26 °C planned indoor temperature. The distribution of wall-heating and cooling fields is the only part of planning which may differ from the planning of convectional (radiators or fan coil) networks. In this phase of planning, the dimensions of surfaces necessary for heating or cooling are defined. After the defining the heat demand for each room, the necessary surfaces to be heated should be defined. When wall-heating and floor heating are applied together, the size of the surface to be equipped with floor temperature adjustment should be taken into account per room: in case of distribution by 10 cm, the heat output is 70 W/m2, and in the case of distribution of 15 cm, 60 W/m2 are calculated. The planned heat demand is reduced by the obtained output and the obtained value should be divided by 84. The result gives the size of the wall surface to be equipped with wall-heating. For example: The heat demand of the room is 1500 W, its heat load in the summer is 600 W. It functions as a bathroom. Its floor space is 10 m2. The floor surface's temperature is wished to be adjusted. First of all, the area of the bath tube should be deducted because it can not give the heating output underneath the bath, even if floor heating is built in there. In the example 8.5 m2 remains. Therefore, 8.5m2 x 60W = 510W. 1500W - 510W = 990W heating output should be provided by wall heating. 990/84=11.78m2 rounded to 12 m2, this area needs to be piped. In case of cooling, it should be checked whether the calculated surface is big enough. Since the bathroom is not cooled, this requires no calculation. In case of rooms, where cooling is required, e.g. sitting-room, bedroom, study, the cooling capacity needs to be calculated and the related surface area needs to be checked. If a larger surface area is calculated for cooling, then it should be taken as reference. The system when in heating method will be oversized after this, but that this is not a problem, it will result in operating the boiler with heating water of lower temperature. It is reasonable to assemble the extra surface produced by the cooling on the ceiling. There is no obstacle of fixing part or all of the pipes on the ceiling due to lack of wall surface, since it is radiating heating and it will work suitably. Pipes running inside the walls should always be planned onto the inside surfaces of outside walls if possible, since this stops cold radiation, which provides the appropriate temperature sensation. As a result, the temperature of the room can be reduced by 1-2 °C, as already mentioned before. The temperature of flow and return water should be taken into account for controlling. The resultant of the two values is ∆t, which is equal to 5 °C in the case of wall heating. Controlling should be calibrated for this value. For example, the 35 °C temperature of flow water is matched with 30 °C temperature of return water. In the case of traditional two-position control, the temperature control of the room operates independently. The built-in temperature detector of the thermostat measures the temperature of the room and the value taken is compared with the required value. A processor determines the switch state, and the connector has only its connecting output in contact with the heat producer. In the case of the traditional two-position control, one-way communication is accomplished from the thermostat to the heat producer. There is no possibility for feedback. Communication is limited to the information whether the connection contacts are open or closed. In double-trunk systems communication and data transfer between the regulator and the heat producer is twofold. In the heat producer the interface of the control unit is responsible for the data transfer to the room-thermostat and for the connecting point between the control electronics of the instrument and the room-control. 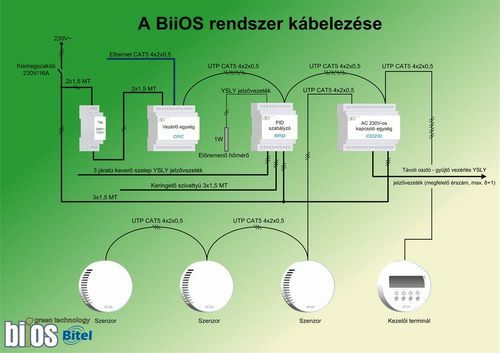 The interface transfers the necessary data from the heating system to the room-control. Either of the solutions can be selected at implementation. A single furnace or gas-geyser can be built in for heating, and the summer operation can be provided by a separate cooling unit for cooling. Where it is possible and required, a heat-pump can also be built in. However, the selling and investment costs are refunded slowly but the continuous increase of energy costs reduces the pay-off period.